Few fruits offer as much sensory pleasure as strawberries, especially in season. 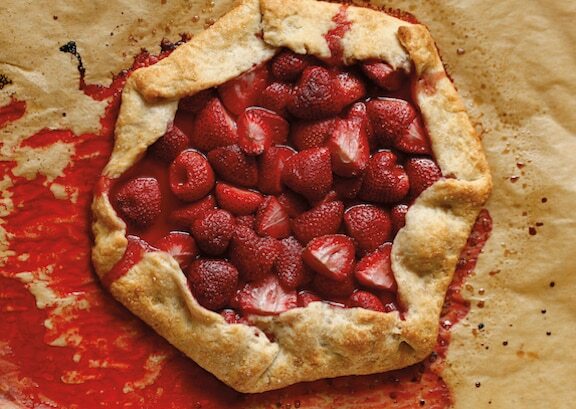 Here are 10 healthy strawberry recipes for late spring and early summer. Desserts, smoothies, and salads, they’re all asy, vegan, and totally delicious. Be aware that strawberries consistently rank near the top of lists of foods most heavily sprayed with pesticides. Read more about that here. The only answer is to buy organic strawberries. They’re more expensive, but they’re usually also riper, sweeter, and juicier than mass-produced strawberries. That being said, let’s dig in! Above, as with all desserts that spotlight fresh fruit, the season’s best berries make Laura Samuel Meyn’s Rustic Strawberry Tart shine. 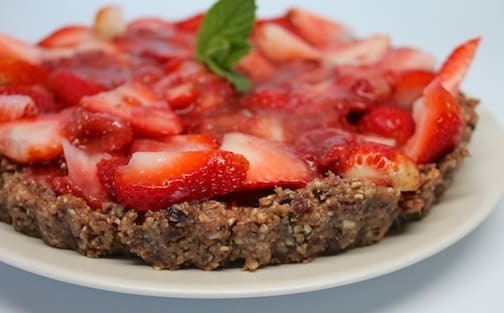 To make the most of the incredible strawberries available in late spring and early summer, try another great tart — Raw Strawberry Tart created by Carrie Forrest. Chocolate-Dipped Strawberries is a two-ingredient classic dessert — how can you go wrong? 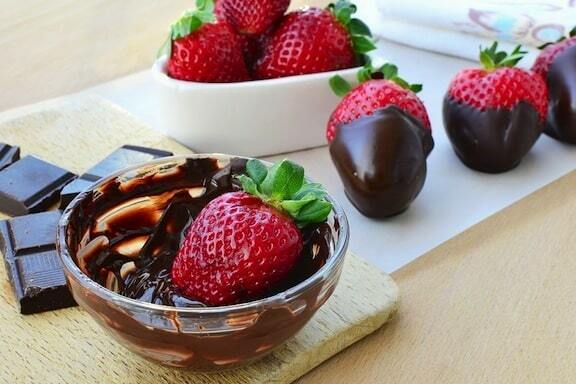 Strawberries and dark chocolate are just made for one another. Though this hardly even qualifies as a recipe, there are are a few tips and tricks that make this come out just right. 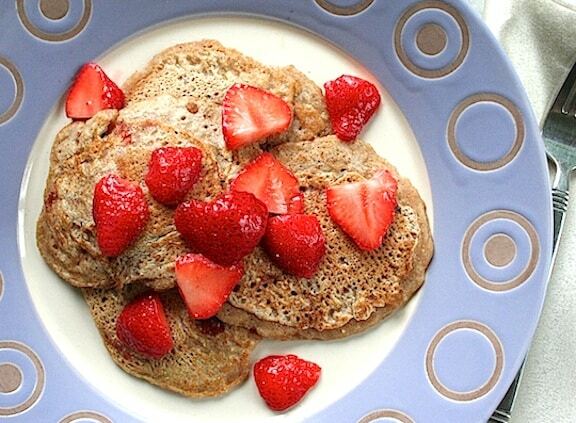 Make these vegan Strawberry Pancakes in late spring and early summer, when strawberries are at their best. Perfect for a relaxing Sunday brunch. 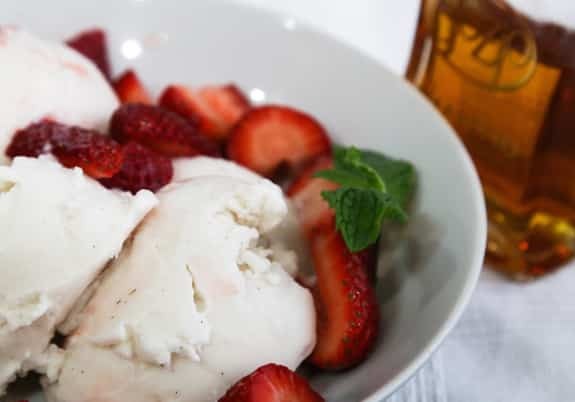 Amaretto Strawberries is almost embarrassingly simple, yet luscious and low in fat. Amaretto is a liqueur made from almonds. Serve over nondairy ice cream for a real treat. 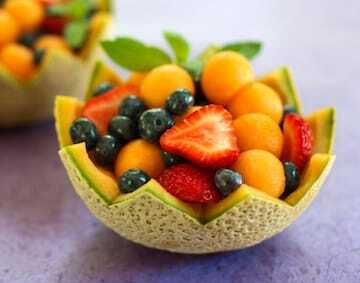 Melon Cups with Strawberries and Blueberries is an attractive presentation of three favorite summer fruits — cantaloupe, strawberries, and blueberries Sometimes all you need is a little creativity to take fruits from so-so to stunning! 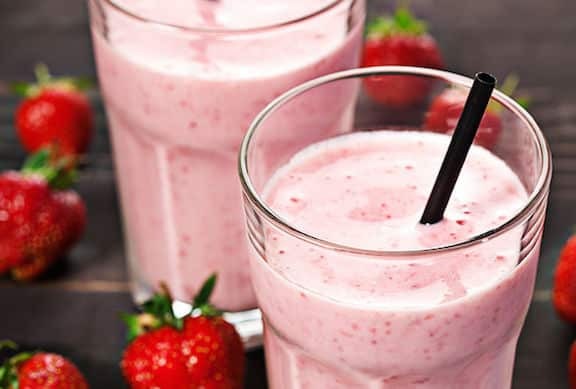 If you’re looking for just one fruit smoothie combo to fall in love with, this Classic Strawberry and Banana Smoothie is a classic for good reason! 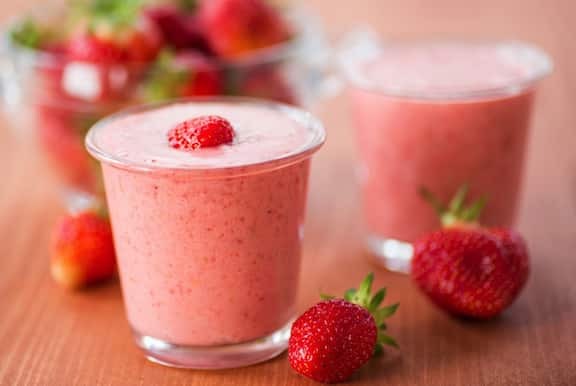 Strawberry-Vanilla Maca Smoothie is another refreshing beverage for you to try. Maca, which has so many notable health benefits, has a caramel-y flavor that blends well into smoothies of all sorts. 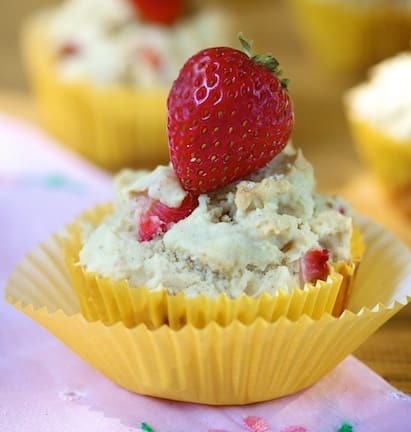 Like quaint little shortcakes with strawberries hiding inside, Allyson Kramer’s gluten-free Strawberry Shortcake Muffins aren’t overly sweet and make a great breakfast on the go. 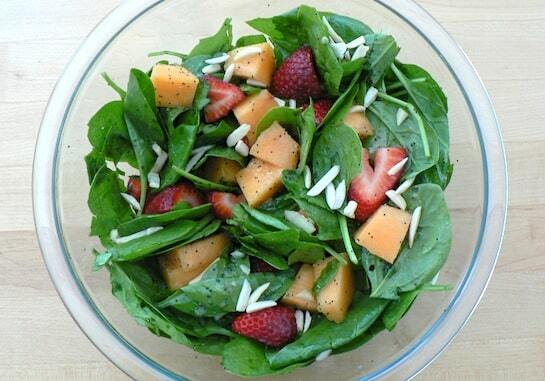 This popular combination of spinach and strawberries in Fruity Spinach Salad by Sharon Discorfano is drizzled with a sweet poppy seed dressing. Here she adds cantaloupe and almond slivers for an unexpected crunch.